The cooler weather of last week calls to mind that autumn is approaching and with it, the fall colors returning to the high country. 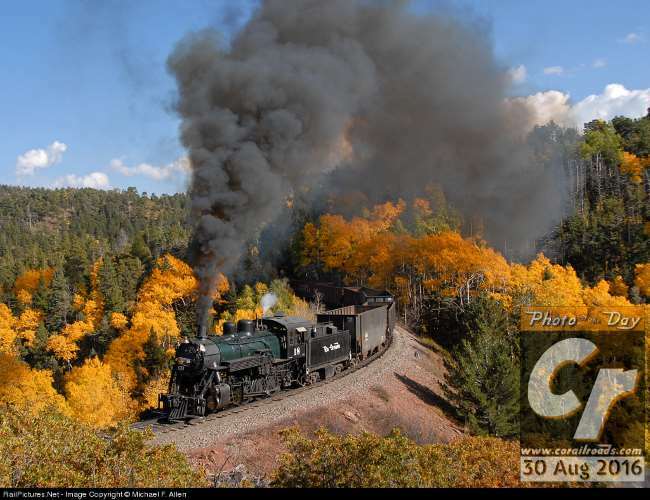 Now, aspens aflame may seem synonymous with a number of Colorado's railroads, but for some reason, I don't readily recall the San Luis & Rio Grande, or as it's known to most folks, the Rio Grande Scenic Railroad as a primary venue for autumn viewing. Could this soon change? The RGSR is booking tickets for its Fall Colors Explorer. Their first class tickets are still available for $130 aboard a standard gauge, diesel service departing Alamosa and Fort Garland for La Veta Pass. While not the typical steam trip, it looks like those willing to part with the tidy sum will enjoy food, wine, and a memorable experience on board to go with their photos. Believe this was a photo freight that cost $500-800 per person. I was on the waiting list but trip was sold out! The autumn explorer trip I rode on the SLRG was LAME! Conductor stopped train where there was NO autumn color. Where there was color he said it was too dangerous to stop - like this location.